There’s no doubt that a sizeable number of people playing this hospital simulator are doing so due to the nostalgia factor, although not too many people may be playing this for the same reasons I am. And from the outset, the game is remarkably similar to Bullfrog’s original. I was struck at the sizing of the main hospital, the entry pattern for patients, the issue of adding windows to make people sitting in clinics feel important (which really works in real life, by the way). In addition, there are actual repercussions for challenges and decisions the whole way through, which always feel fun. I shouldn’t harp on about how surprised I am that game design has improved after 20 years, but there is a great feeling about taking the best bits of something I enjoyed a long time ago, and turning it into a wonderful experience. Which brings me to the issue of medicine. 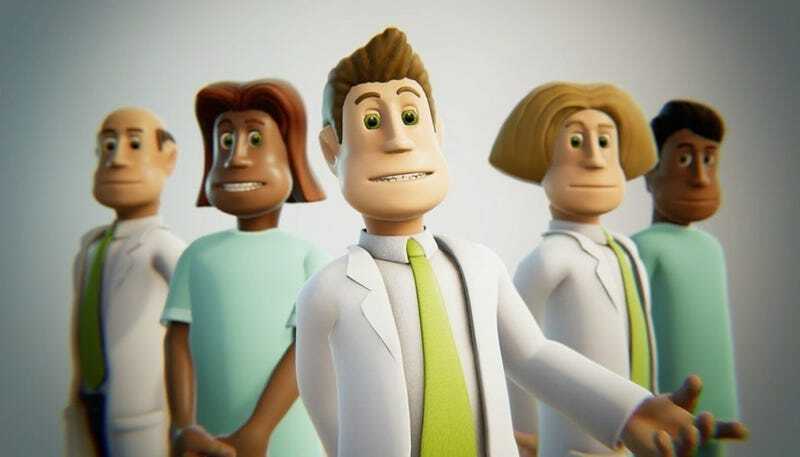 Two Point Hospital seems to deal with death a lot more compared to its predecessor, or maybe it’s just the way I’m playing it. I still recall the odd feeling I had more than a decade ago when receiving the message from my acerbic guide, “You just killed your first patient. How do you feel,” especially when I was trying to work out how to keep people alive in real life. In Two Point, it wasn’t too soon after a patient died that I had to hire a janitor with a Luigi’s Mansion buff to sort out its ghost. Patients die a lot more frequently, and there’s a weird way you’re supposed to just accept it and deal with providing the most care to the most people. Sleep well, peaceful with the knowledge that these games have been training the people who are responsible for your lives. Now that’s true, of course, but I’m very impressed at how these kinds of high-stakes issues are humorously dealt with (it is a game, after all), but somehow not ignored either. One of the most critical issues in hospital administration is root cause analysis — that, following a critical incident (or near miss), we have to dispassionately work out why an issue occurred, and walk a fine line between allocating blame or identifying the systems failures that led to the critical incident. In this virtual case, I was surprised to find that the patient’s loss was due to a nurse I’d hired who had excellent skills in ward management but poor skills in treatment, coupled with a poor quality drug dispenser. Finding that the process I’d use in real life worked perfectly in the game was a great testament to its design. I don’t tend to hire too many ghostbusters in real life, though. Staff management is utterly fantastic. There is a real issue between ensuring staff are in the right roles, busy in the business of curing patients, but also the long-term effects of having them attending training. It’s great that there are actual efforts at the sort of “touchy-feely” training courses like positive attitude training that real life staff absolutely despise but we know actually work. I’m amused that I can train a general practitioner to perform psychiatric interventions in approximately a week. I’m sure it shouldn’t really take that long. There is also a great secondary goal in progressively training staff to become capable in multiple fields, together with the expected jump in ego and entitlement which leads them to ultimately demand huge pay rises or leave. In addition, this game appears to operate in a world without industrial relations laws, where I can fire any clinician I wish at any time. I refrain to comment on the benefits to my emotional health as a result of being able to indulge in this fantasy. There was a brilliant moment midway through one of the levels when I was struggling to work out how to improve the satisfaction of my staff. People were grumpy, patients were queuing in droves, I was throwing more and more money at everything I could think of, but nothing I was doing seemed to work. I simply couldn’t work out how to lift people’s spirits. And that’s the most accurate issue about administration that the game is able to portray. There is this illusion that you can manage everything, but sometimes, things simply don’t work. You’ll still be blamed when things fail, however. More importantly, when you get things right, and things go well, you won’t get any of the praise. Just a sort of grudging general observation that you don’t seem to be doing any work. When dealing with a complex system, there are ways of determining what’s going on, and making changes that lead to benefits. However, they don’t always work, although you certainly learn from every failure. Satisfaction is derived from knowing you did the best job you could, and learned more about doing things better next time. The biggest challenge about the original game was how it became a race against time, the time factor being the poorly programmed internal workings of the game. At higher levels, if you played a level for too long, eventually bugs started to creep into your hospital - rooms would fail and become inaccessible, doctors and patients would get stuck, and eventually the entire game would halt. It was a weird sort of meta challenge in an age before software patches, and an odd sort of nostalgia to note bugs in this iteration as well, such as with save games. However these will sadly be likely fixed in an upcoming update, ruining the difficulty forever. I’m very grateful for Theme Hospital for a number of interesting hidden dynamics, some of which I’m slowly discovering with delight have filtered through to Two Point Hospital, and instrumental for me at an important point in my career. Doctors are happiest when they’re curing patients, regardless of the money they make. Psychiatrists are always happy. Always. Happy. Any doctor conducting research, no matter what they do, will progressively get angrier and angrier, and need breaks from research before they decompensate. This is unfortunate, as research provides the greatest possible benefit to the largest number of people. Surgeons must always be monitored — leave a surgeon alone for a while, and you’ll eventually discover them operating nonstop regardless of how tired they are, driven by the adrenaline of the act of surgery alone. Keeping a senior clinician at the front line makes for a much more accurate diagnosis — although you lose the money that you would have made sending the patient on numerous expensive diagnostic procedures. You can get by with an average doctor, but you can not cope with an incompetent nurse. Big, open corridors are beautiful, but incredibly expensive and difficult to heat. Hospital cleanliness can not be relied on even with the most capable cleaning staff, and you often need to directly intervene as no one can be everywhere at once. Every minor change you make early on will come back to bite you at some stage in the future. Sometimes games can be art, and art’s purpose is to hold a mirror to real life. And then sleep well, peaceful with the knowledge that these games have been training the people who are responsible for your lives. Dr Neil Jeyasingam BSc(Med), MBBS, MBus(HealthAdmin), FRANZCP, Cert(FPOA) is a psychiatrist and clinical director of a major tertiary teaching hospital. The opinions expressed are his alone. Get his book PSI: A Mental Health Novella here.